"Baby furniture" isn't just for babies anymore. Today's value-conscious parents are furnishing the nursery with quality pieces that will serve many purposes in their lifetime. "Good furniture is an investment for the future," says Lisa Rae Oshesbaby furniture cribky, owner of Organic Bebe, a catalog and Internet retailer. That's on many new parents' minds these days, since September is the month with the most births in the United States, followed by August and July, according to the National Center for Health Statistics. This season, traditional styles in cherry, maple, poplar and oak are big sellers. Cribs that convert to beds or settees and dressers that can temporarily serve as changing tables are especially popular. "Parents are looking for multifunctional items for the nursery," says Pam O'Hallaron, lead interior designer for PoshTots.com, an on-line boutique of children's furnishings. One of the company's best-selling lines features a cherry crib that converts to a toddler's bed or a settee. The dresser features a removable top for changing the baby, and the book case can become a secretary desk that's perfect for a lap top computer. The armoire can hold baby clothes and accessories now. Later it can be transformed into an entertainment center housing a television and other electronic equipment. Cribs that can become full-size bed frames are another practical choice. One side of the crib serves as the headboard, and the other side becomes the foot board. Slats are added to support the bed. Oshesky says the maple crib, armoire, dresser and bunk beds she bought for her three boys still looks beautiful eight years later. "This type of furniture is timeless," she says. "It's kind of like a first teddy bear. As the years pass, the children become attached to it. You can buy these things and pass them down." Oshesky is a big believer in surrounding children with natural products. "Wood kind of warms the soul," she says. "The natural coloring is very comforting." You may have to budget a little more for high quality furniture, but it pays off in the long run. Pieces that starts out in your child's room can eventually furnish a guest room or home office. They can be refinished to adapt to a different look. O'Hallaron suggests choosing nursery furniture that will complement the style of your home. PoshTot's Americana collection includes a poplar armoire with red painted accents. Poplar also can be painted white and distressed for a French country or cottage look. Maple in a natural finish is available in Shaker styles. The crib remains the focal point of any nursery. 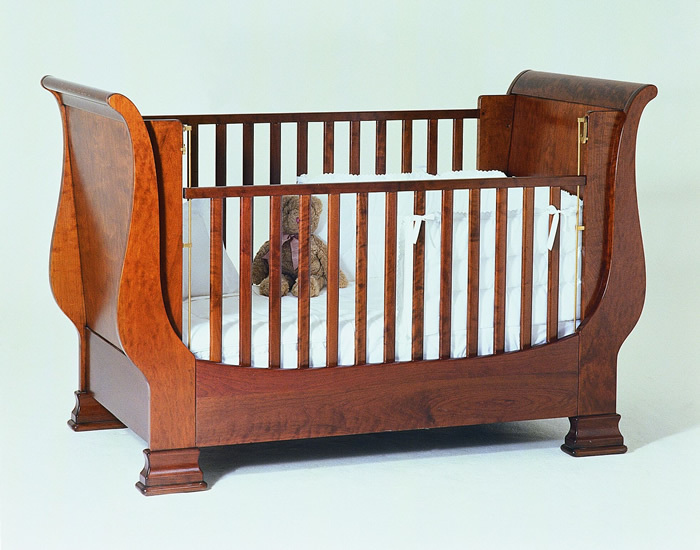 The sleigh-style crib has been popular for years, along with dramatic four-poster styles. A round crib, which can be topped by an eye-catching canopy, allows the baby to look out from all sides. Soften the look of more sophisticated nursery furniture with fanciful linens and other accessories. Chenille bedding and stuffed animals are popular. Hand-painted lamps with decorative shades are also a nice touch.